« How will campaigns use Ashley Madison data? How will media? I’m angry today. Maybe it’s because of watching the GOP “debate” or the BLM protests or maybe it’s because of the Planned Parenthood attack. But as I thought of all this I started getting angry. You’ll like me when I’m angry. Because when I get angry I get strategic. Then tactical. Then I take a shower.Then I write a blog post. I say it’s time to help the billionaire backers destroy each other–while they target their opponent’s chosen candidate. But the help I’m thinking of is not just helping one less obnoxious candidate win against another. I want to help them in a way that turns the public on all of them and their system. What story would Brietbart want to run about Scott Walker that could hurt Koch? What Fox Business story would piss off the hedge fund managers who did NOT back Chris Christy and his pension fee scheme? Maybe the team that spend 14 million bucks hunting the Clintons will start hunting Trump. I’ll have to ask Joe Conason if they are available for hire. Who will run the whisper campaign that Rove ran on McCain? I know it’s hard to hurt billionaires and I know good people like my friends at the Center for Media and Demcracy are going after the Kochs, and raising money to expose other robber barons, but is anyone actively looking for serious ways to get these jokers in trouble? And by trouble I mean put them in jail, and by jokers I mean the big money players who have “nothing to hide” yet don’t want the public or their investors to know what they are doing? Is someone creating dissension in their ranks so they attack each other or split themselves up? If one group of ham handed right wing ratf****** try to sell deceptively edited video about Trump passing themselves off as “journalists,” well you didn’t tell them to do it. 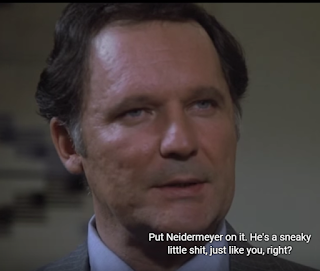 Remember in Animal House, where they assigned Neidermeyer to do the dirty work? Why not? They are good at it. It was sadly hilarious to watch Fox ask “tough” questions and then get praised for it on the left. But Trump fired back. Ailes doesn’t want Trump? Let’s help Fox uncover dirt. Ask them for journalism! Get the supporters of Lindsey Graham to dig into Trump like he dug into Obama’s birth certificate. But…and this is important, don’t ask the MSM to do this. Because that would mean doing their actual jobs, not just reporting on the horse race. Productive anger with your eyes on the prize. My anger at right wing talk radio hosts, their distributors and their disgusting violent rhetoric, led me to act. Since 2007 it has cost the industry 100’s of millions of dollars in lost ad revenue (mostly from customer facing sponsors.) People have lost jobs. Distributors have had to make embarrassing statements to stockholders about their failure to keep the cash coming. This includes the great work done by my friends who focused on Glenn Beck and Rush Limbaugh. They have stopped 100’s of millions of commercial advertising dollars from going into the wallets of distributors. This cutting of an easy revenue stream hurt them. They fought back, but, because we had the law and sponsors on our side, we had cover. So who will help us in our fight between GOP billionaires? All the people working for GOP billionaires, Fox News and all the people working for Donald Trump. Let’s use these people to our ends. I derived this idea from another old saying. “Let’s you and him fight.” –clever old guy who wins when his competition fight each other, instead of him. We assume that eventually the candidates “throwing red meat to the base” stuff will stop, but not yet. And you can’t just go into one RW billionaire’s puppet lair secret bast headquarters and work on his behalf to attack another billion—oh wait a minute, yes you can. It happens all the time. The Ron Paul people were great at this. Various candidates are trying to distance themselves from the crazy to seem moderate for the general election, but as we know, when you fight crazy people they fight back. I suppose it’s like bear bating, only you aren’t the bait, they are. It might be fun to watch. BTW, I’m not suggesting this just clears the path for my favorite candidate. I’m suggesting we use the momentum of one big nasty player on another. Who wins after that is still up in the air. Help them focus their own arrogance, pride and deviousness on each instead of our candidates–and the rest of the country.